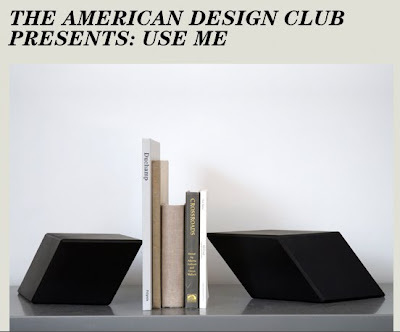 For its sixth show since its founding in 2008, the American Design Club presents “Use Me”: an exhibition by 45 young American designers of unapologetically functional objects, each of which exhibits a strong sense of purpose, intelligent use of materials, and the ability to do one thing extremely well. Real Ok Design (above), Alex Chatham, The Fawn Conspiracy, Alexandra Snook, Free Time Industries, Biodidactic Design, Andrew O. Hughes, Annie Lenon + Valerie Gnaedig, Bec Brittain, B. Light Design, Benjamin Harrison Bryant, Brendan Keim, Brendan Ravenhill, C McKeough Unlimited, Grain, Chuck Routhier, Colleen & Eric, Conor Klein, Craighton Berman Design, Daniel Michalik Furniture Design, David Tsai, Debra Folz Design, Ladies & Gentlemen Studio, Emily Rothschild, sit n damico, Fort Standard, Iacoli & Mcallister, Isaac Yu Chen, Jen Turner, Jess Fügler, Jill Peterson, Joey Roth, Kyle Daevel Design, studioooij, Swinton, Michelle Weinberg surface design, nonlinear Studio, Patrick Townsend, Peter J Pless Design, Reed Wilson, Raven & Boar / Hivemindesign, Steph Mantis Design, T M V Design, Tim Liles, Thomas Im, and Formed and Found.